Lots of September eggplants mean I am looking for great recipes to enjoy them to the fullest. This happens to be one of my favorite ways to do just that. It is a vegetable curry, now don’t be put off by that; no long list of spices: only a couple and some fresh ginger in it and it isn’t too spicy or wild tasting. I have simplified it a bit and as a bonus I give you my best eggplant frying tip. Yeap, it is vegetarian but that can be a nice change of pace from all that meat. I serve it over brown rice and it is very satisfying. You can feel virtuous enjoying this savory entree and use all that fresh fall produce. This recipe came from my favorite Indian cookbook Indian Cooking for Pleasure by Charmaine Solomon. This 70’s bible for Indian cookery is out of print and very pricey to buy on line. I have used literally dozens of recipes from it. She knows her spices and chooses great recipes that always work. You can use big fat eggplants as I did this time or smaller ones; you will just need more of them. These days there are many interesting smaller eggplant varieties; any will work here; just cube, no need to peel. 1 small red pepper and 1 poblano pepper, seeded and diced. Heat 3 Tbsp. mild oil in a large frying pan. Fry the cubed potatoes until golden; you will need to turn them a few times. Remove from pan. Add the eggplant and fry until cooked; once the oil is soaked in I wait a half minute and add a couple tablespoons of water to the pan; let the water steam off and the eggplant should be done; if you have to do that again; go ahead. This trick saves adding a lot more oil to keep the eggplant from sticking/burning. When mostly done remove from pan. It will cook more later so it is okay if edges and bits are not fully done. Note: you could fry the eggplant at the same time in a separate pan to save a few minutes if you are in a hurry; might take a touch more oil that way; worked for me. Then, add a touch more oil to the same (now empty) pan and pour in the chopped onion and fry until soft and turning golden. Add the cumin, turmeric and grated ginger. Fry for a minute, stirring. Add the chilies, tomatoes and salt, stir well and add back the eggplant and potatoes. Tip: when I make this in a wide 12 inch frying pan I don’t have a big enough lid; I use an upside down metal pizza pan and it makes a great lid. Top with the spinach or kale. Stir after a minute, cover and cook on low heat for a few minutes until the spinach is soft, adding up to ½ cup water to keep it from sticking/burning. Add the brown sugar and cook the curry uncovered until it is thick; no more than 8-9 minutes. Serve with Indian bread or brown rice. As I haven’t really found time re-create my favorite Indian breads I served mine over brown rice. What a chilly spring! Cold nights and days mean my tummy craves warm comforting soup. This leek potato soup fits the bill and then some. It is also known as vichyssoise: the fancy French name for pureed leek and soup. My mom used to make it when I was a kid, in the summer she served it chilled and in the winter it is perfect hot from the pot. Both versions are awesome. I love to make this recipe as it gives me the opportunity to yank out my boat motor blender and let it go! It is a small, hand held immersion blender that is fun and effective although it often leaves a few chunks of potato and leek in my soup which I kinda like. I used half and half to make it creamy. The original recipe uses heavy cream but I wanted to lighten the fat load, sometimes I use plain whole milk. I have a friend who makes it with nonfat milk, in my mind that is going a tad too far in that austere direction. Don’t use less than 2 percent if you want a rich creamy texture and great mouth feel. You could mix some cream and some milk. Whatever works for you or is in the fridge! Note: if your chicken broth is unseasoned you will need to add salt for sure; taste and add as much as you desire; I have added salt as an ingredient for that reason. If you use broth containing salt taste before adding any additional salt. You can guild the lily by sprinkling this with chopped fresh chives, nice but not necessary. I use my heavy bottomed small soup pot. 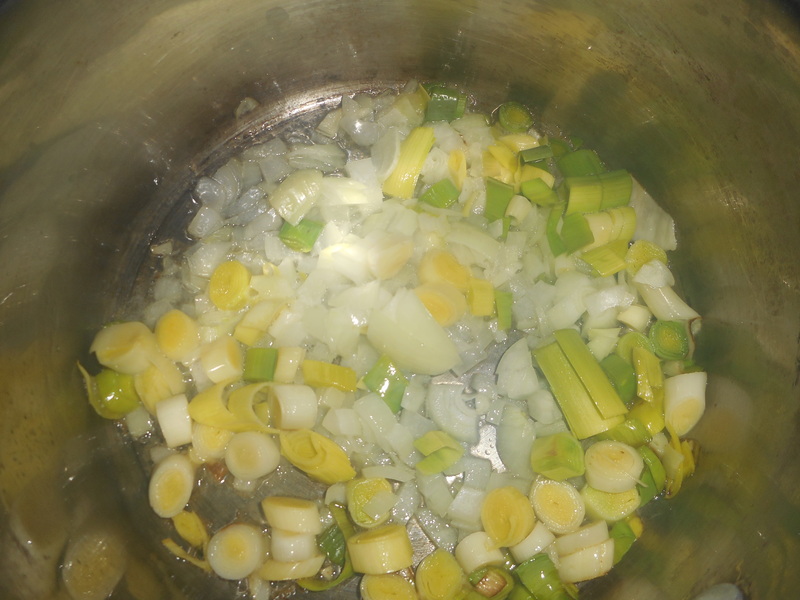 Heat the butter, add the onion bits and leek slices. Cook 4 minutes. Add 3 cups gluten free chicken broth. I really prefer Kitchen Basics; says GF on box and tastes great. 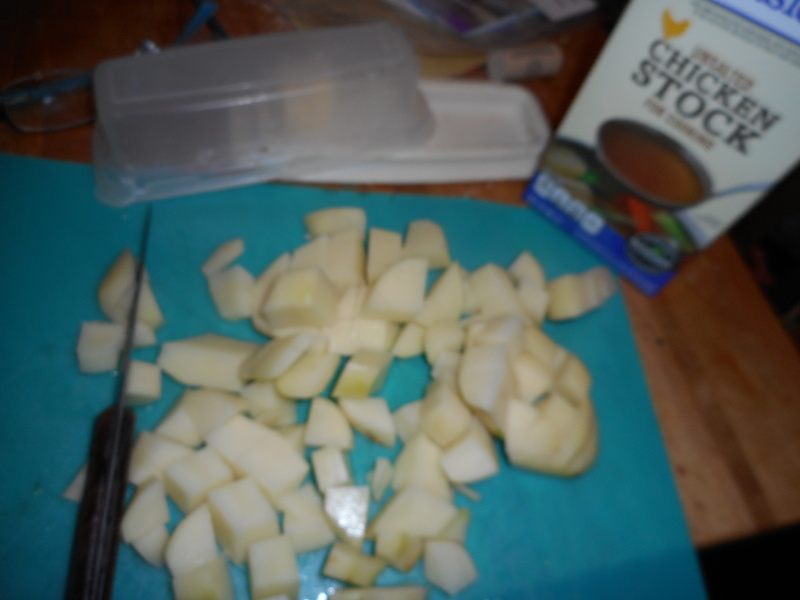 Heat to boiling, add the diced up potatoes, cook 15 minutes or until potatoes are done. Add more broth if it seems low in liquid. I add up to 4 cups broth and then I add water to thin it further if needed. I usually poke the potatoes with a fork to check for almost falling apart status. Turn off and let stand 10 minutes. 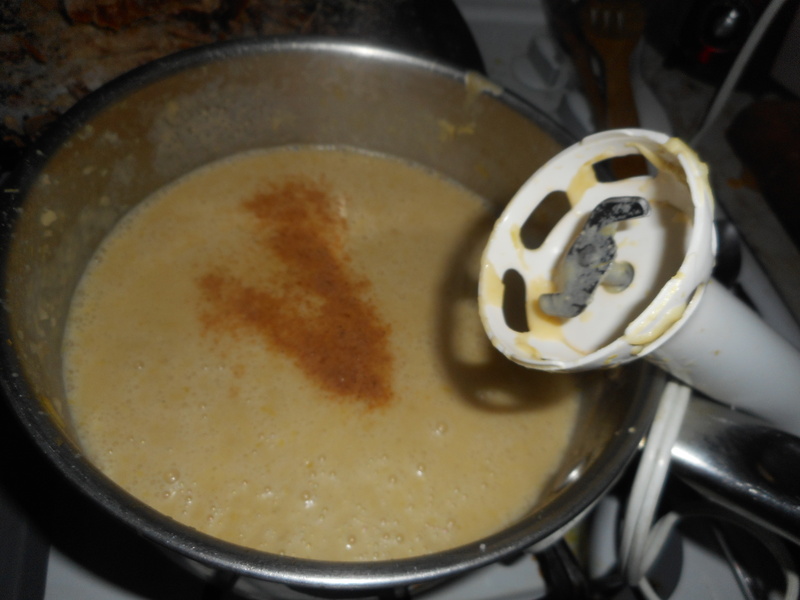 Use an immersion blender to puree the mixture. Can also use a blender or a food processor for this action but in any case, be very careful not to burn yourself with a splash of hot soup. Add half and half, half the salt and the mace. Blend them in until it is smooth. Add more salt if you desire. White pepper is good as a seasoning too. Great hot or well chilled once we reach that lovely season of summer heat that makes a chilled soup seem fabulous. Right now, it is practically the last thing I want to eat. Anyway, enjoy it hot or cold. This recipe is an adaption from The Joy of Cooking, a handy resource volume for classic recipes like this one. Great taste never goes out of style. Originally posted March 2015. Slightly revised. 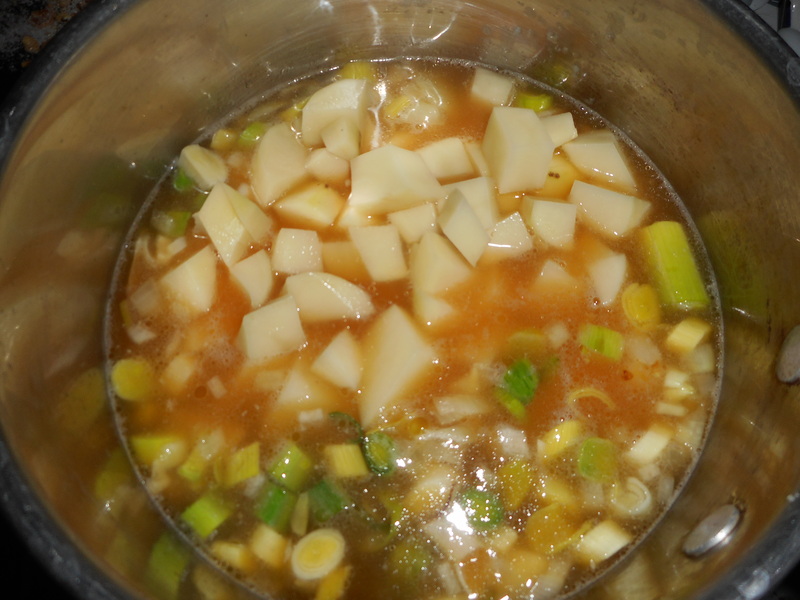 What a wicked nasty winter….speaking objectively… I keep posting soup ‘cause it keeps snowing! Cold winter nights and days mean my tummy craves thick comforting soup. Satisfying and filling after a harrowing drive home from work. This leek potato soup fits the bill and then some. 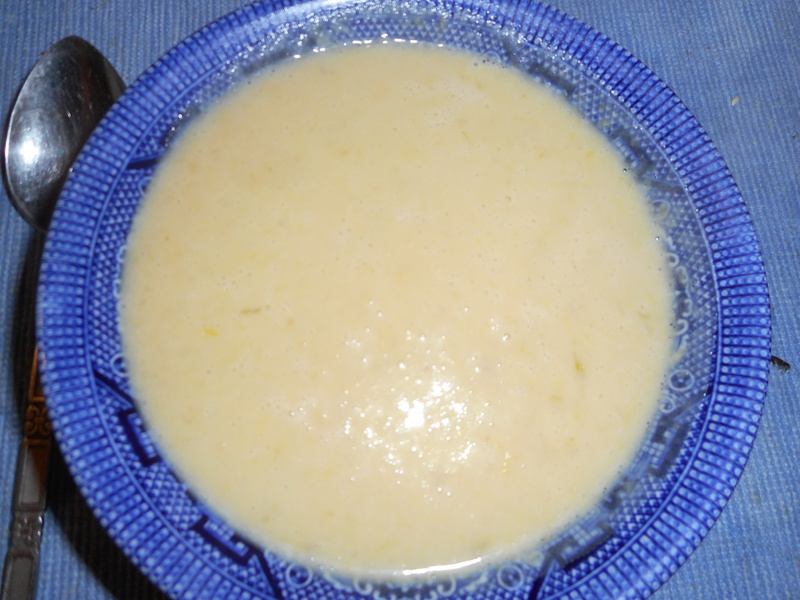 It is also known as vichyssoise: the fancy French name for pureed leek and soup. My mom used to make it when I was a teen, in the summer she served it chilled and in the winter it is perfect hot from the pot. Both versions are awesome. This soup uses half and half to make it creamy. The original recipe says heavy cream but I wanted to lighten the fat load and I sometimes pour in plain whole milk. I have a friend who makes it with nonfat milk, in my mind that is going a tad too far in that austere direction. Don’t use less than 2 percent if you want a rich creamy texture and great mouth feel. You could mix some cream and some milk. Whatever works for you or is in the fridge! I use my heavy bottomed small soup pot. A heavy metal bottom helps things cook evenly and lessons the possibility of burnt soup at the bottom of the pot which is never a happy thing. Heat the butter, add the onion bits and leek slices. Cook 4 minutes. Add 3 cups gluten free chicken broth. I really prefer Kitchen Basics; says GF on box and tastes great. Heat to boiling, add the diced up potatoes, cook 15 minutes or until potatoes are done. Add more broth if it seems low in liquid. Pour out the half and half into a measuring cup and let it warm to room temperature while the soup cooks. I usually poke the potatoes with a fork to check for almost falling apart status. Turn off and let stand 10 minutes. Use an immersion blender to puree the mixture. Can also use a blender or a food processor for this action but in any case, be very careful not to burn yourself with a splash of hot soup. Add half and half, the mace and salt to your taste. Blend them in until it is smooth. Great hot or well chilled once we reach that lovely season of summer heat that makes a chilled soup seem fabulous. Right now, it is the LAST thing I want to eat…cold soup. NOOOOOOoooo. Anyway, enjoy it hot this chilly March. This recipe is an adaption from The Joy of Cooking, a handy resource volume for classic recipes like this one. Great taste never goes out of style.